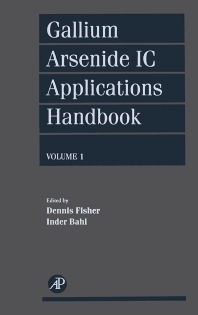 Gallium Arsenide IC Applications Handbook is the first text to offer a comprehensive treatment of Gallium Arsenide (GaAs) integrated chip (IC) applications, specifically in microwave systems. The books coverage of GaAs in microwave monolithic ICs demonstrates why GaAs is being hailed as a material of the future for the various advantages it holds over silicon. This volume provides scientists, physicists, electrical engineers, and technology professionals and managers working on microwave technology with practical information on GaAs applications in radar, electronic warfare, communications, consumer electronics, automotive electronics and traffic control. The primary audience for this book includes: materials scientists, solid state physicists, electrical engineers, and technology professionals and managers working on microwave technology. Because this book deals with all aspects of Monolithic Microwave Integrated Circuits (MMICs) technology and applications, it can be used for a one-semester course at the senior or graduate level as well as for a 35 day short course organized for professionals. Internationally, this bookwill find a good audience in Japan, given their interest in this technology. I. Bahl and D.G. Fisher,<$> MMIC Technology Overview:<$>Introduction. Brief History of MMICs. Benefits of Monolithic Integration. Advantages of GaAs for MMICs. MMIC Active Devices. MMIC Design. GaAs IC Fabrication. MMIC Packaging. Summary. I. Bahl and D.G. Fisher,<$> MMIC Application Overview:<$> Introduction. Role of GaAs MMICs in Systems. Historical Market Projections. Military System Applications. MIMIC Program. Commercial System Applications. Summary. J. Naber, <$> Digital GaAs Integrated Circuits:<$> Introduction. Logic Design. Trade-offs between Silicon and GaAs. Digital GaAs Product Insertions. Summary. I. Bahl and D. Hammers,<$> Phased-Array Radar:<$> Introduction. Phased-Array Radar Architectures. Subsystem Functions and GaAs IC Applications. Transceiver Module Technology. Summary and Future Trends. R. Schineller,<$> Electronic Warfare I Transmitters:<$> Introduction. EW Subsystems. Generic EW Chips. Summary. Future Trends. S.B. Moghe, S. Consolazio, and H. Fudem,<$> Electronic Warfare II Receivers:<$> Introduction. The Crystal Video Receiver Structures. Superheterodyne Receiver Structures. Channelized Receiver Structures. IFM Receiver Structures. Integrated EW Transmit/Receive Modules. Other EW Receiver Types. Summary and Future Trends. V. Peterson,<$> Instrumentation:<$> Introduction. Technology Choices and Merits of Using GaAs ICs. Typical Instrumentation Block Diagrams and GaAs IC Opportunities. Application Examples. Conclusions and Future Trends. J. Mondal, S. Ahmed, and S. Moghe,<$> Personal Communications Service:<$> Introduction. Requirements for a PCS Voice/Data System. MMIC Components for PCS. Future Trends in PCS. J. Mondal and S.B. Moghe,<$> SatelliteCommunications:<$> Introduction. Evolution in Communications Satellites. MMIC Technology in Satellite Transponders. Space-Qualified MMIC Components. Space-Qualification of MMICs. MMIC Subsystem Design Examples. Future Direction. C. Huang,<$> DirectBroadcast Satellite Receivers:<$> Introduction. System Descriptions. Receiver Components. GaAs MMIC Development For DBS. Commercially Available GaAs MMICs. Designing Receiver Components with MMICs. Application Issues. Future Trends.Appendix A. Appendix B. Appendix C. Index.